Make these gooey and sweet instant pot cinnamon rolls in under an hour with your electric pressure cooker. This recipe requires no rise time thanks to two amazing kitchen helpers: baking soda and baking powder. This recipe does not require yeast. Don’t get me wrong, I love my yeasted bread but it felt wrong to have to 1-2 hours rise time for an Instant Pot recipe. Unless I am making yogurt, I do not want to wait longer than an hour for a recipe to be ready. I want my cinnamon rolls ready quickly! Let me tell you. We were not disappointed! We ate a little bit on the day I made them and the rest for our Sunday breakfast. I knew I wanted to try cinnamon rolls in my instant pot ever since I heard about someone making Pillsbury cinnamon rolls in their electric pressure cooker. I just knew I needed to try making them from scratch. There are quite a few ingredients listed below. Don’t be alarmed! These are the ingredients for the cinnamon roll dough, the filling, and the cream cheese icing. There are a lot of components that go into making cinnamon rolls. Luckily, you get to skip the rise time, dough punching, and second rise time all while still having from scratch cinnamon rolls hot, fresh, and ready to eat! In a small bowl, whisk together the light brown sugar, 4 tablespoons granulated sugar, cinnamon, cloves, and salt. Whisk in the 1 tablespoon melted butter until it resembles wet sand. Set aside. Brush 1 tablespoon melted butter on the bottom and sides of a 7-inch push pan. Set aside. In a large bowl, whisk together the flour, remaining 2 tablespoons granulated sugar, baking powder, baking soda, and 1/2 teaspoon salt. Mix 2 tablespoons melted butter into the soured milk. Make a well in the center of the dry ingredients and pour in the soured milk + butter. Pour your dough onto a floured surface and knead until the dough becomes smooth. Roll the cinnamon roll dough into a 9×12 rectangle. Brush the dough with 2 tablespoons melted butter and sprinkle the filling on top of the butter – leaving 1/4 inch of space around the edges. Pat it down so it sticks, leaving 1/4 inch around the edge of the cinnamon roll dough. Roll the dough lengthwise until it resembles a log. Pinch the seams along the edge and on the ends so they stick. Cut the log into 6 equal pieces. Place one piece in the center of your push pan and the remaining 5 around the center cinnamon roll. Brush the tops of the rolls with the remaining 2 tablespoons melted butter. Pour 2 cups water in the bowl of your Instant Pot electric pressure cooker and place the trivet inside. Create a foil sling with a long piece of foil, folded lengthwise into thirds. Gently place the foil into your pressure cooker with the ends poking out on both sides. Place a paper towel on top of your push pan (with cinnamon rolls inside) and cover with a piece of foil. This keeps the water out of your cake pan so your cinnamon rolls don’t get soggy. Gently lower your cinnamon rolls (with the paper towel and foil still on top) into your pressure cooker. Fold the ends of the foil sling over the top of your push pan so they are accessible after your instant pot cinnamon rolls have cooked. Close lid and set to “sealing”. Cook your the cinnamon rolls on high pressure for 23 minutes. Natural Pressure Release (NPR) for 15 minutes. 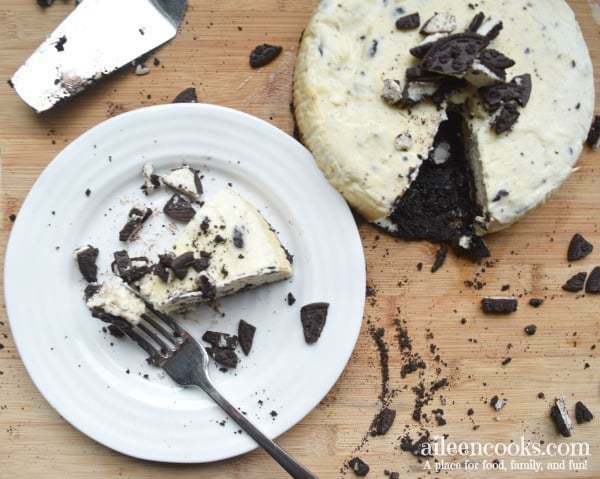 To make the icing: Mix together softened cream cheese and 2 tablespoons milk. It will be lumpy. Whisk in the powdered sugar until smooth. Once the cinnamon rolls are finished cooking, gently remove the pan using your foil sling. Let cool 10 minutes. Remove the cinnamon rolls by pushing them out from the bottom (this is where the push pan comes in handy). 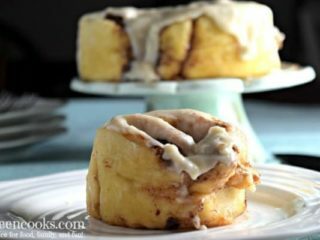 Spread the icing over the top of your instant pot cinnamon rolls and enjoy immediately. Refrigerate any uneaten portion and reheat prior to serving. 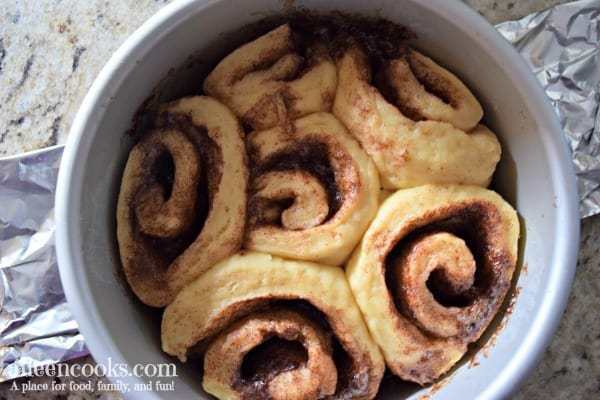 Why use a paper towel and foil to make instant pot cinnamon rolls? Covering your instant pot cinnamon rolls with a paper towel and then sealing with foil is very important. 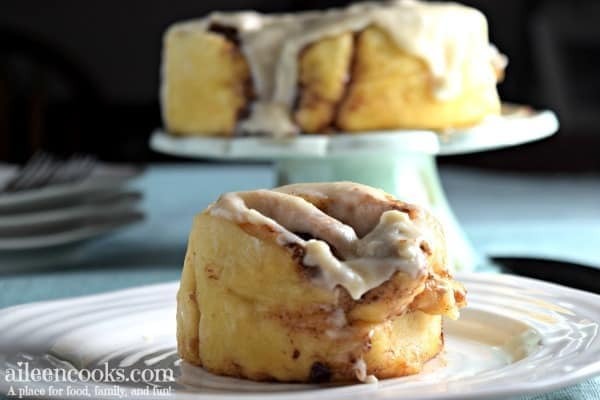 Since you are cooking the cinnamon rolls in a pressure cooker with water, the paper towel and foil keeps most (if not all) of the moisture away from the cinnamon rolls. Would rather make traditional icing instead of the cream cheese frosting for your instant pot cinnamon rolls? I recommend you use the recipe in this post for Banana Blueberry Muffins with Vanilla Glaze. Do You Want More Great Instant Pot Recipes? For more instant pot recipes and tips, join our group on facebook and subscribe to our weekly newsletter. Make these sweet and gooey cinnamon rolls in your instant pot. 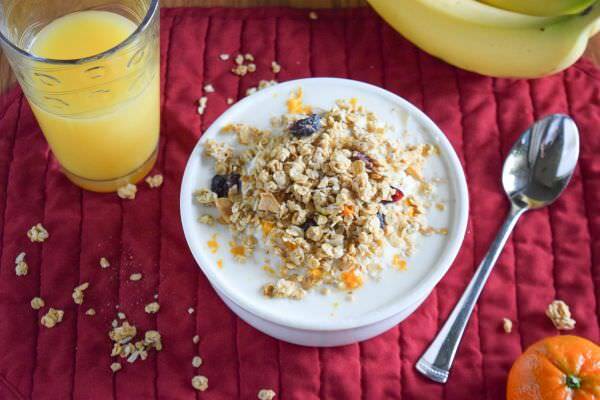 This recipe is 100% from scratch and requires no rise time! Roll the cinnamon roll dough into a 9x12 rectangle. Brush the dough with 2 tablespoons melted butter and sprinkle the filling on top of the butter - leaving 1/4 inch of space around the edges. Place a paper towel on top of your push pan (with cinnamon rolls inside) and cover with a piece of foil. This keeps the water out of your cake pan so your cinnamon rolls don't get soggy. Close lid and set to "sealing". Cook your the cinnamon rolls on high pressure for 23 minutes. Natural Pressure Release (NPR) for 15 minutes. We love a delicious batch of warm and gooey cinnamon rolls, but the rise time can be a bummer. 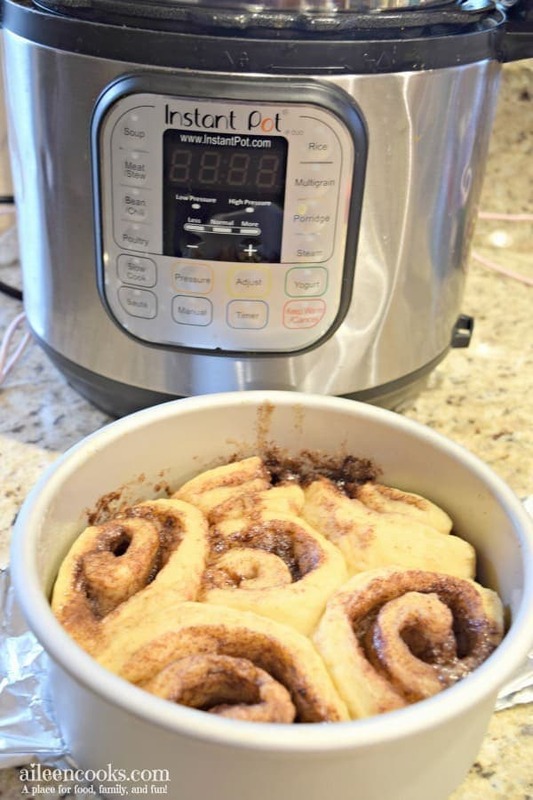 This recipe for instant pot cinnamon rolls saves so much time! Have you tried prepping them the night before so they can just be placed into the IP in the morning to “cook”? Hi Vicki! Yes, you can totally do all of the prep the night before and pop them in your pressure cooker in the morning. Enjoy those cinnamon rolls! Will the pressure cooking time increase if all prep done night before and taken from refrigerator to pressure cook in the morning? Hi Bonnie! If you are taking the batter straight from the fridge to pressure cooker, I would add 5 minutes. If you let it come to room temperature first, there is no need to change the time. Do you leave the paper towel in the instant Pot while they are cooking ? Hi Ann! Yes, the paper towel stays in the Instant Pot while cooking It absorbs any extra moisture over the cinnamon rolls. ACK!!! I have no idea what happened but this was a total FAIL for me! I followed your recipe. The Fat Daddio push pan leaked cinnamon sugar all over the bottom of the IP insert and was dripping when removed. The rolls rose nicely but were very doughy so I placed the pan (on the foil that covered it in the IP) in a 350F oven for 5 min. to firm up and slightly brown. Inverted the pan of rolls onto a plate. They looked good but they were now hard and still not brown. My husband couldn’t even cut into one. So disappointed. Oh no! I am so sorry this happened to you! I will continue to test this recip so I can figure out exactly what happened to you. Did they turn out for you once they were baked? Same thing happened to me. Did the 23 + 15 NR (doubles up on the paper towel too). Too doughy and not close to being cooked. Put in a new paper towel, and set it for 10 + 10 NR. Better but still doughy. Putting it in the oven to see if this can be saved. Wonder what went wrong. Is there a push pan for the IP mini? Hi. In the filling part of recipe it calls for 4 tablespoons sugar. That is the only granulated sugar mentioned. On the rolls part. It says to add remaining 2 Tablespoons of sugar. My question is. Is some of the 4 Tablespoons in filling section supposed to go in the rolls section? Hi Roxy! Thank you for catching that discrepancy in the instant pot cinnamon rolls recipe. It should be 6 tablespoons granulated sugar for the rolls. 4 tablespoons in the filling and 2 additional tablespoons added to the cinnamon roll batter. I will update the recipe. Thanks again for bringing this to my attention. I hope you enjoy them! I noticed that it says 6 tbsp for filling and in the directions it clears up where the tablespoons go. looks so good. Cannot get the pilsbury cinnamon rolls here in Australia so i NEED this recipe. I have a Philips multi cooker not the actual instant pot but I’m hoping this will work the same. Hi Joey! Yes, it should work the same. Enjoy those cinnamon rolls! These look sooo good! Is there any way to adjust the recipe for an oven? I don’t have a instant pot, just a crock pot. Hi Angela. Yes! This recipe is actually adapted from an oven recipe I have used for many years (but have not yet posted). Just prepare as directed, and bake at 425 degrees for 23-25 minutes, until golden brown on top. Enjoy! These look amazing!!! My kids would devour these! Hi there! Can this be prepared in a 6″ fat daddio pan? What would be the cook time? Thanks! Hi Jenn. Yes, it can be prepared in the 6 inch instead of 7-inch. They may need to be squished a little in there but should fit. I have not personally made it in the 6-inch pan, so I’m not sure on the cook time. I would advise you start with the original cook time. If they seem to be a bit undercooked, add 5 more minutes. for those who do not have a springform or push up pan just line the pot with tin foil or parchment paper. thus wilol work too. Hi there. 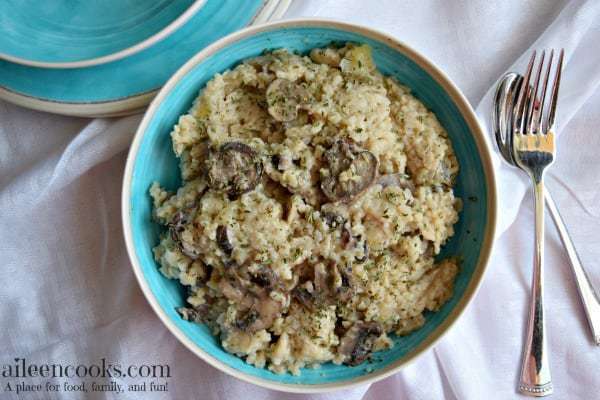 Did you use a 6 or 8 qt instant pot for this recipe? I have the 8qt so I was wondering if I need to make a larger batch, or would this work? I hope this works out and I was really supposed to leave the paper towel on top as it was cooking. Recipe looks great, I just didnt understand the paper towel and foil part. I will let you know. Hi Marci. Yes, the paper towel and foil are supposed to stay on while cooking. This helps create a barrier between the cinnamon rolls and any water that may try to get in there. I hope it worked you enjoyed them! My pressurw cooker has no “sealing” setting, just high or low? Please tell me what a push pan is, is it a removable bottom pan? Hi Suz. Yes, it’s a cake pan with removable bottom. Here is the one I have: http://amzn.to/2FEpKvm (affiliate). 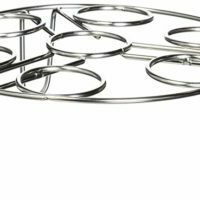 A springform pan can also be used. Disappointed. Dough was VERY soft. Tried adding 1/4 c more flour but was still quite unmanageable. Went ahead with cooking. It wasn’t done so put back in IP for another 4 min & 10 min NPR. Barely edible. Didn’t even save the leftovers. This was my experience too. I haven’t started cooking because I can’t get my dough to set up at all. Any tips? Hi Savannah. If your dough is still sticky, I would recommend adding more flour. Keep in mind that it is not a yeasted dough, so it will still be softer than a traditional cinnamon roll dough. I hope this helps. Hi 🙂 Do you think I can sub gluten-free flour for the all purpose flour in this recipe? Hi Parizad! I’m not sure on the gluten free flour as I have not personally tried. Please let me know how it turns out! Success! I used a corningware dish without a removable bottom but had no problems with sticking. I did end up cooking for a total of 28 mins probably because of the cookware I used. Yay! I’m so glad it worked out for you! I don’t know what happened. I covered the pan with a paper towel and foil, but when I took my pan out of my IP, the dough was raw looking and swimming in liquid (is it melted brown sugar??). I put it in the oven to try to save it….It’s baking in there right now. I hope I can save it! Hi Diane. I am so sorry it came out uncooked. I’m guessing the extra liquid was the liquid from the bottom of the pot. The paper towel is supposed to help with it. I hope it ended up turning out okay in your oven. I followed the recipe exactly and they were doughy straight out of the instant pot. I had to put them in the oven to finish baking. 🙁 I was so excited for this. How do I reheat them this morning? We have three left over? Hi Rachel! Just reheat in your microwave for about 30 seconds Enjoy! I tried to convert this to vegan by subbing soy milk, earth balance (in place of butter), and Tofutti faux cream cheese. The texture was very doughy. Perhaps a longer cook time for my next try. Also, perhaps a few paper towels on top next time since one seemed fairly soaked through. Thanks for sharing how you converted it to vegan! The flavor was very good but mine were very doughy on top. The paper towel was completely wet. Maybe I should try a larger towel and a bigger piece of foil. It didn’t ruin them but I think I like mine a little firmer. I did use a corning ware bowl and it seemed to work fine for that part. Thanks for sharing. Unfortunately I had the same problem as the others- dough was hard and very doughy. Had to finish them in the oven but should have put them in the oven from the beginning and not the instant pot. Followed recipe to a T and they were still very raw and doughy on top. Like others my paper towel was sopping wet as well so that moisture was just sitting on top of the rolls. Carolyn, I am so sorry this didn’t work out for you. Can I ask which pot you have? I’m working on finding solutions and that would really help me troubleshoot. The dough is denser due to the biscuit type dough used in this recipe. You could always try a traditional risen cinnamon roll dough and baking it the same as that would make the dough lighter. I am having trouble visualizing the foil part of this recipe. 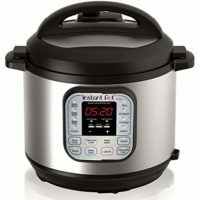 Step by step photos could be really helpful for first time instant pot users! Hi Sarah! Check out this post. 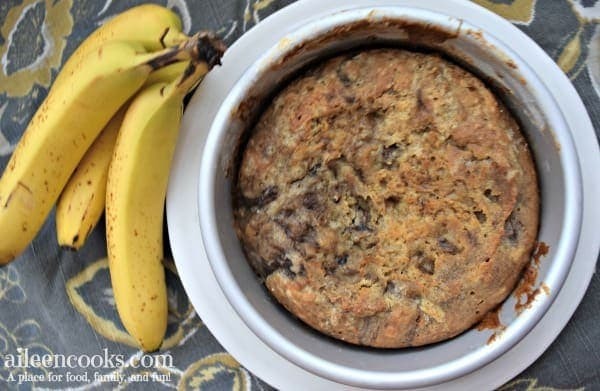 It is for banana bread, but I use the same method and it includes pictures. Anyone tried using almond milk? Is it even possible to make it w/o the sour milk? I made as directed and put the rolls into a 1.4 quart bundt pan. I did not cover them with a paper towel or tin foil and cooked per directions. After cooling 5-10 minutes, I turned them out onto a plate and the sugar was a nice glaze over the top and worked as the frosting. Thanks for sharing! I’m glad you enjoyed them, Dorothy. I made these in my 6 qt last night! I ending up adding an additional round of cooking (7 minutes HP, 10 minutes NPR) because they were too doughy, it could have been the thickness of my dough or just that I used a springform pan. Either way, it turned out great with some slight adjustments!